Hello and welcome back! We're a group of current and former Artisans, and you're sure to find some inspiration here every month. Sometimes we feature colors, a sketch or like this week a theme of "anything but a card". You might have just arrived from Erica Cerwin. I've had this project on my to-do list for a couple of years now. My parents celebrated their 50th Wedding Anniversary in 2012, and I wanted to make an album that featured a photo of them from each year of their married life. I know...quite an ambitious project! Since I missed the original deadline of the anniversary itself, I had some more time to decide how to complete the project. My original intention was to make a digital album, but recently I decided that using the current (and soon to be retired!) Love Story Project Life by Stampin' Up! card collection and accessory pack was the perfect way to complete this project. Another issue that makes the project challenging is that all of the pictures from the earlier years are located at my parents house 500 miles away from me! So, having pockets that I can slip photos in as I collect them will also make the project more doable. I can complete all of the pages for pictures I have, and then take it to my parents house on my next visit with minimal supplies and finish the album! I call that a win-win. Hello and welcome back! 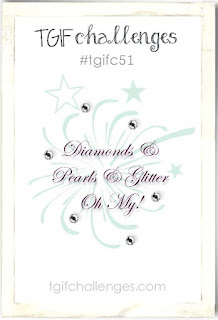 I'm popping in tonight with a quick card for the TGIF Challenge Blog, and their 51st Challenge to "get your shine on". The idea was to use silver, gold, glitter, pearls...anything shiny and fancy. I can certainly do that! I've been wanting to put this diamond die cut from the You're So Lovely Project Kit with the gemstone print from the Shine On paper, and today was the day! This is the perfect challenge for it. I backed the diamond die cut with Dazzling Diamonds Glimmer Paper, and put that over a layer of the White Filter Paper to help it stand out from the background a little more. Hello and welcome back to another Artisan Design Team Blog Hop. You're in for a treat because we have so much talent and so many different styles represented by these 20 women from around the globe. Please keep hopping through all 20 so you don't miss a thing! Be sure to use something like Google Translate for those blogs not in your native language. Also, you can find all of our projects for the year in one easy place, on our board. You might have just arrived from Krista Frattin, and I just know you loved her beautiful project as much as I did. Our focus this month was on the Gift Box Punch Board and the Bow Builder Punch in addition to some lovely stamp sets. I chose to work with the Made with Love Stamp Set. It has the cutest images! I made a gift box to hold a set of 3x3 thank you cards, and a baby congratulations card. Hello, and welcome back! I'm popping in tonight to share another card using the Shine On Specialty Designer Series Paper, this time for a baby card. I also used the Balloon Celebration stamp set. The small polka-dot pattern from the Shine On paper is a great backdrop for a baby card. For the sky, I used a piece of Soft Sky Cardstock, and stamped the clouds with Whisper White Craft Ink. Hello and welcome back! I'm here today with this month One Stamp At a Time Blog Hop. Our theme this month is Tac Tac Toe, so I chose glitter pen, dies and sequins. And, here are my projects for this week. I made a card holder box, and 4 cards and envelopes to go inside. Hello and welcome back! I'm popping in tonight to share a quick card that I made with the Shine On Specialty Designer Series Paper. The color scheme here is Calypso Coral, Bermuda Bay, Cucumber Crush, kraft and Whisper White. I colored just one of the types of gems on the silver foil patterned paper with a Calypso Coral marker. Hello and welcome back! 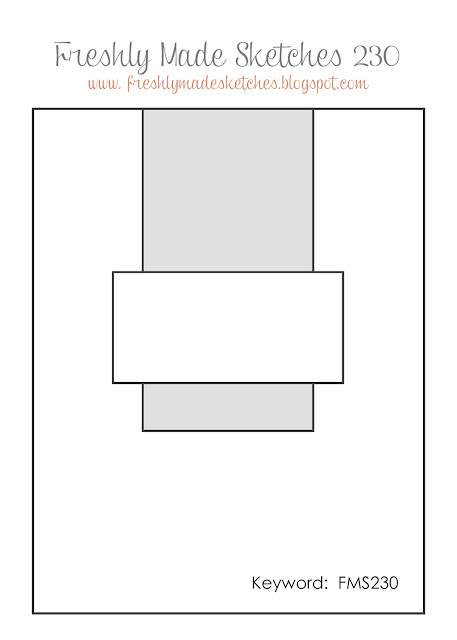 I had fun making another card for a different challenge, so here is my card for Freshly Made Sketches #230. I had an idea to make a plaid using the striped mask and watercolors. I think maybe the background is a bit bright, but it definitely makes a statement! I'll have to try it again with more water and less ink, or even lighter colors. I used Watermelon Wonder, Crushed Curry, Pool Party and Wild Wasabi for this plaid. I alternated green and yellow stripes one way, and aqua and red the other way. I used a piece of Thick Whisper White cardstock with the Ornate Tag Topper Punch, and some White Baker's Twine below. Hello and welcome back! I'm here to share a couple of card for the Global Design Project #029 Color Challenge, and what a challenge it was. Look at those colors! 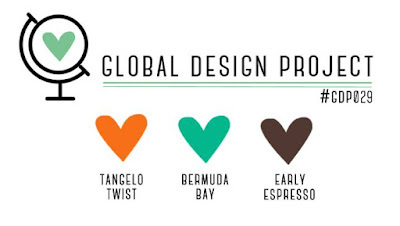 While there's nothing wrong with these colors, let's just way that they are not my go-to colors. That said, I love the cards I came up with. I thought these colors would work well with butterflies, so I pulled out my Watercolor Wings and both butterfly die sets, Butterflies Thinlits and Bold Butterfly Framelits. I cut the outline butterfly image from watercolor paper, and colored it with Tangelo Twist and Bermuda Bay, blending in the middle. The detailed outline butterfly was cut from Early Espresso Cardstock. I just adhered it in the middle, so the edges lift a little for more dimension.